The Fontana Unified School District officers keep the rifles in a safe at their assigned school or secured in their patrol car each day. FONTANA, Calif. — The high-powered semiautomatic rifles recently shipped to school police in this Southern California city look like they belong on a battlefield rather than in a high school, but officials here say the weapons could help stop a massacre like the one that claimed the lives of 26 students and educators in Connecticut just weeks ago. Fontana Unified School District police purchased 14 of the Colt LE6940 rifles last fall, and they were delivered the first week of December — a week before the shooting at Sandy Hook Elementary School. Over the holiday break, the district’s 14 school police officers received 40 hours of training on the rifles. Officers check them out for each shift from a fireproof safe in the police force’s main office. Fontana isn’t the first district to try this. Other Southern California districts also have rifle programs — some that have been in operation for several years. Fontana school police Chief Billy Green said he used money from fingerprinting fees to purchase the guns for $14,000 after identifying a “critical vulnerability” in his force’s ability to protect students. The officers, who already wear sidearms, wouldn’t be able to stop a shooter like the one in Connecticut, he said Wednesday. Some parents and students, however, reacted with alarm to the news that school resource officers were being issued the rifles during their shifts. The officers split their time between 44 schools in the district and keep the rifles in a safe at their assigned school or secured in their patrol car each day before checking the weapon back in to the school police headquarters each night. “If the wrong person gets ahold of the gun, then we have another shooter going around with a gun. What happens then, if that situation occurs?” said James Henriquez, a 16-year-old sophomore who just enrolled at Fontana High School this week after moving from Texas. Other students said they felt disillusioned that officials would spend money on semiautomatic rifles while the district eliminated its comprehensive guidance counseling program two years ago. The district saved millions by restructuring guidance services, said Superintendent Cali Olsen-Binks. “I understand that people are looking at the layoffs, but $14,000 and $7 million is a huge disparity,” she said. The 40,000-student district came up with the school rifle program after consulting with top school safety experts and looking at what other large districts had done, said Olsen-Binks. Santa Ana Unified School District, in nearby Orange County, has had a rifle program for about two years that operates similarly to the one Fontana has started, said police Cpl. Anthony Bertagna. The Los Angeles School Police Department also deploys rifles to its officers as needed, the department said in a statement. It would not say how many rifles district police have but said the weapons are kept in the department’s armory and are handed out and returned daily. 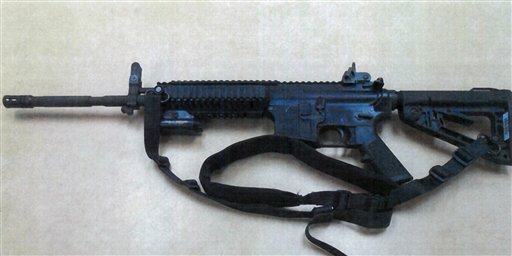 The San Bernardino City Unified School District police force purchased four Bushmaster semiautomatic rifles last July, said Linda Bardere, a district spokeswoman. Fontana is a city of about 200,000 people east of Los Angeles. Only sergeants are authorized to check out the rifles from the police armory, where they are kept. All officers have been trained for years to use the rifles. The Fontana rifle purchase did not require approval from the school board but member Leticia Garcia said she believes there should have been a public discussion before they were purchased.